Posted by sense on 26th July 2016 in for a night out, Lifestyle. Extreme tiredness, thumping headache, dehydration, sandpaper mouth, and an extreme sensitivity to light. Yes, these are just some of the symptoms we experience during that nasty hangover phase that follows the night before, should you have decided to over indulge. And, it’s all caused by fluctuating hormone levels and chemical by-products from alcohol that affects the body in a number of ways. People have been inventing their own “hangover cures” for centuries, due to the largely understudied science of what actually causes these nauseating symptoms. 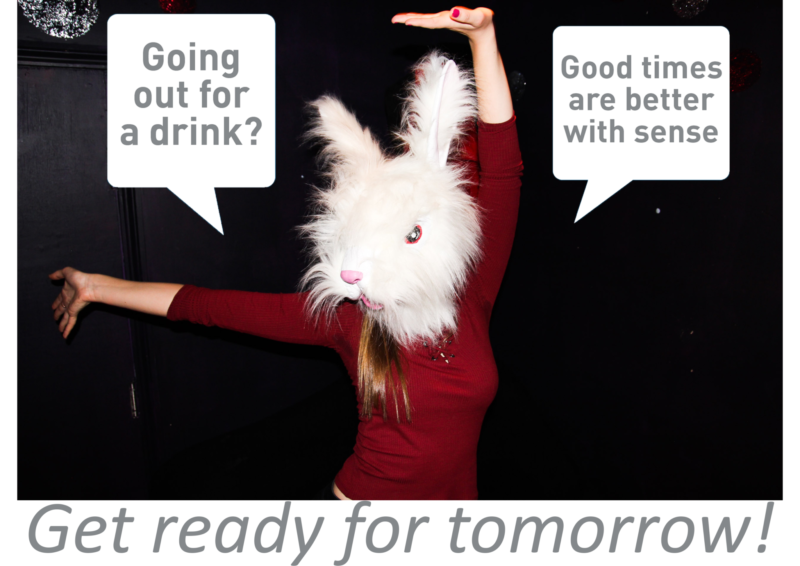 Of course, we all like to have fun once in a while, but we still need to make smart decisions and drink sensibly! While nothing (except abstaining from alcohol altogether) could guarantee a totally hangover-free morning, there are certain strategies that you can put in place to help protect your body from the not-so-fun side-effects of a night out, if you are without a scientific remedy. So, here are some easy-to-follow tips to help prevent you from having an absolute shocker the next day. Before you head out, make sure you’ve had a good bite to eat beforehand. A fully fed stomach will help to slow down the absorption of alcohol and reduce the severity of the dreaded hangover. Meals like a sandwich on whole grain bread, whole wheat pasta or stir-fry brown rice are all tasty options that will boost the body’s immunity to fight harder against the changing hormone levels and alcohol chemicals in the body. For extra endurance, fill up on some greens like asparagus and other cruciferous vegetables, for example, broccoli andbrussels sprouts. The amino acids and minerals in these kinds of vegetables will help to reduce the next day’s unpleasant symptoms. Whilst you’re sipping on your martini or lugging down your beer, the alcohol entering your system is fiercely pushing away all other liquids in your body, using any available source it can find, even your brain! Inevitably, this quite quickly leads to dehydration, so make sure you are continuously drinking water throughout the night. A good rule of thumb is to match each alcohol drink with a small glass of water to prevent that dreaded sandpaper mouth the next day. The more expensive liquors tend to contain fewer congeners, which are naturally occurring substances produced during the fermentation process. Some people experience the effects of these congeners in the form of headaches during their hangover. If these kinds of liquors are just too expensive for you, remember that darker drinks, like red wine or whiskey, contain naturally occurring congeners, so stick to white spirits like gin and vodka, or opt for white wine instead of red. Ever wondered why bubbles seem to make the alcohol rush straight to your head? Well, research suggests that bubbles may cause alcohol to be absorbed more quickly by the body, which explains why ‘things happen’ on New Year’s Eve or at Bachelor/Bachelorette parties. So, even though they taste great, remember to slow down and rehydrate with water continuously. Firstly, refrain from drinking any more alcohol. Some people swallow a painkiller before bed, but this can irritate the stomach. Research has also shown that taking even mild medicines such as paracetamol or acetaminophen after drinking can lead to liver damage… especially when it becomes common practice to pop a pill before you go to sleep. 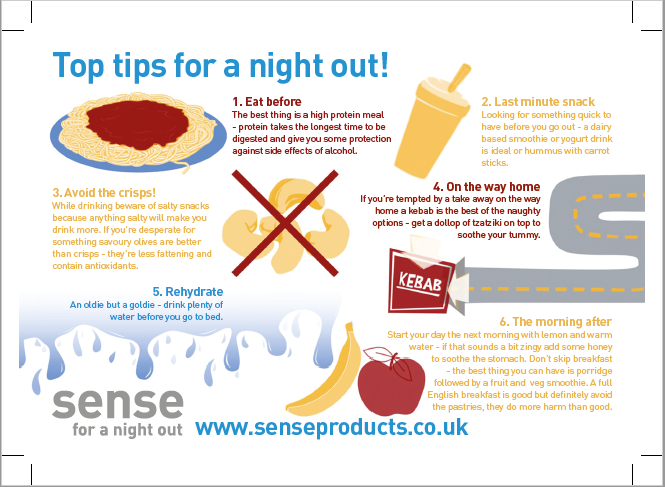 Consider taking more natural food supplements like sense* for a night out, which is specially developed for drinking, that offer similar assistance in a much more effective way.